For the past few months, I have been experimenting with decoding VOA Radiogram. 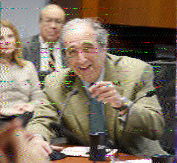 VOA Radiogram is a weekly half-hour show broadcast over shortwave on the Voice of America. Conceived by Kim Andrew Elliott in 2013, VOA Radiogram transmits text and images digitally for reception using only ordinary shortwave radios and computers. 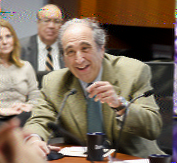 Each VOA Radiogram program is broadcast four times every weekend. All four broadcasts originate at the Edward R. Murrow transmitter site in North Carolina. For more information, see the article How to decode the modes at the VOA Radiogram website. One nice feature of the Sangean ATS–909 is its line-out jack. I can hook its output to my computer soundcard without disabling the internal speaker (or volume control) of the ATS–909. 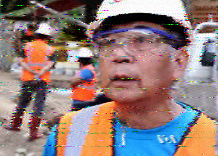 I have been trying to decode at least one of the VOA Radiogram broadcasts per weekend. Just for fun, this weekend I decoded three of the four VOA Radiogram broadcasts. Although it came in well this week, this broadcast is the one that usually gives me the poorest results. I often have problems with severe signal fading, perhaps due to my distance to the transmitter. This doesn’t happen with any of the other frequencies. The reception quality this week was a little bit poorer than usual, but still pretty good. This is the broadcast which usually gives me the best decoding results. All of the pictures (with the notable exception of the fourth) were the best this weekend. There are only a few lines of noise in the first and third pictures, and virtually none in the second. Every week, Kim Andrew Elliott compiles a gallery of images decoded by listeners as an electronic QSL for reception reports. Some of the received images from around the world are very impressive. Because of my location (only around 850 miles from the transmitter site), I can almost always receive the text of the broadcast with no errors. I figure the trick for me is to try to get as clear a decoding of the images as possible. It is great to see the good results you’re having with VOA radiograms. 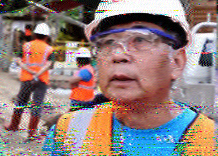 I have been trying to decode VOA radiograms with FLDIGI, but was unable to decode the text / picture successfully. I could hear the signals, but not decode. Have you captured any of these recording in a wav file? If so I would appreciate if you could email me this so I can ensure my software settings are correct and look at the radio more closely (maybe the filters are not right). Found the archive. My apologizes for the request. I had looked, but for some reason did not find the archive in a downloadable format until this am. For us living over 2,350 miles from the transmitter the copy is usually less than 100%. I use FLDIGI and the software works great. There is at least one frequency of the four that comes in very good. I have been listening for only the past 3 months and find the broadcast a good use of shortwave broadcasts.